“You” and “your” refer to you, as a user of our Products. A “user” is someone who accesses, browses, crawls, scrapes, or in any way uses our Products. “We,” “us,” and “our” refer to Shop Local Club Card Limited. “Content” means text, images, photos, audio, video, location data, and all other forms of data or communication. “Your Content” means Content that you submit or transmit to, through, or in connection with our Products, such as ratings, reviews, “likes,” “helpful” votes, comments, questions, replies, messages, and information that you publicly display or displayed in your account profile. “User Content” means Content that users submit or transmit to, through, or in connection with our Products. “Shop Local Club Card Content” means Content that we create and make available in connection with our Products. “Third Party Content” means Content that originates from parties other than Shop Local Club Card or its users, which is made available in connection with the Site. “Site Content” means all of the Content that is made available in connection with our Products, including Your Content, User Content, Third Party Content, and Shop Local Club Card Content. Subject to these Terms and our policies, we grant you a limited, non-exclusive, non-transferable, and revocable license to use our Products. If you are accessing our Products as an individual, then any and all use must be for your personal, non-commercial use only. If you are accessing our Products on behalf of a business entity, then any and all use must be for such business entity’s internal business purposes in connection with the establishment or continuation of a business relationship with Shop Local Club Card. Your use of our Products is at your own risk, including the risk that you might be exposed to Content that is offensive, indecent, inaccurate, objectionable, or otherwise inappropriate. You must create an account and provide certain information about yourself in order to use some of the features that are offered through our Products. You are responsible for maintaining the confidentiality of your account password. You are also responsible for all activities that occur in connection with your account. You agree to notify us immediately of any unauthorized use of your account. We reserve the right to close your account at any time for any or no reason. You represent that any information that you provide when creating your Shop Local Club Card account is accurate. We encourage you to provide complete information about yourself. You may not impersonate someone else, create or use an account for anyone other than yourself, provide an email address other than your own, or create multiple accounts. If you represent a business, brand, or product, you must disclose your affiliation in any reviews or other User Content that you may post. You retain all rights in, and are solely responsible for, Your Content posted to Shop Local Club Card. However, you grant Shop Local Club Card and its users the right to use Your Content in the ways described below. You alone are responsible for Your Content, and once published, it cannot always be withdrawn. You assume all risks associated with Your Content, including anyone’s reliance on its quality, accuracy, or reliability, or any disclosure by you of information in Your Content that makes you personally identifiable. You represent that you own, or have the necessary permissions to use and authorize the use of Your Content as described herein. You may not imply that Your Content is in any way sponsored or endorsed by Shop Local Club Card. With your permission, Shop Local Club Card may ask to use Your Content in a number of different ways, including publicly displaying it, reformatting it, incorporating it into advertisements and other works, creating derivative works from it, promoting it, and distributing it. However, we will never allow others to use the images or audio that is uploaded(“Other Media”). As such, if you allow, you will hereby irrevocably grant us a perpetual, non-exclusive, royalty-free, assignable, transferable, sublicensable, worldwide license to use Your Content for any purpose. You also irrevocably grant the users of our Products and any Other Media the right to access Your Content in connection with their use of the Site and any Other Media. Finally, you irrevocably waive, and cause to be waived, against Shop Local Club Card and its users any claims and assertions of moral rights or attribution with respect to Your Content. By “use” we mean use, copy, publicly perform and display, reproduce, distribute, modify, translate, remove, analyze, commercialize, and prepare derivative works of Your Content, of course with your permission. We will retain full rights to Your Content until such time as you deactivate your account (resulting in all of Your Content being deleted from Our Products), or remove a specific piece of Your Content from Shop Local Club Card (for example, editing or deleting a specific rating, review, question, or comment). Following termination or deactivation of your account, or if you remove Your Content from Shop Local Club Card, we may retain Your Content for a commercially reasonable period of time for backup, archival, or audit purposes. Furthermore, Shop Local Club Card and its users may retain and continue to use, store, display, reproduce, modify, create derivative works, perform, and distribute any of Your Content that other users may have stored or shared through our Products. As between you and Shop Local Club Card, you own Your Content. We own Shop Local Club Card Content, including but not limited to visual interfaces, interactive features, graphics, design, compilation, including, but not limited to, our compilation of User Content and other Site Content, computer code, products, software, aggregate user review ratings, and all other elements and components of the Site excluding Your Content, User Content and Third Party Content. We also own the copyrights, trademarks, service marks, trade names, and other intellectual and proprietary rights throughout the world (“IP Rights”) associated with Shop Local Club Card Content and our Products, which are protected by copyright, trade dress, patent, trademark laws and all other applicable intellectual and proprietary rights and laws. As such, you may not modify, reproduce, distribute, create derivative works or adaptations of, publicly display or in any way exploit any Shop Local Club Card Content in whole or in part except as expressly authorized by us. Except as expressly and unambiguously provided herein, we do not grant you any express or implied rights, and all rights in and to our Products and Shop Local Club Card Content are retained by us. We may publicly display advertisements and other information adjacent to or included with Your Content (for example, a product advertisement may be featured next to your review of that product). You are not entitled to any compensation for such advertisements. The manner, mode and extent of such advertising are subject to change without specific notice to you. User Content (including any that may have been created by users employed or contracted by Shop Local Club Card) does not necessarily reflect the opinion of Shop Local Club Card. We reserve the right to remove, modify, or reinstate User Content at our sole discretion for any reason, and without notice to you. For example, we may remove User Content if we believe it violates these Terms or our policies. We have no obligation to retain or provide you with copies of Your Content, nor do we guarantee any confidentiality with respect to Your Content. Remove, circumvent, disable, damage or otherwise interfere with any security-related features of our Products, features that prevent or restrict the use or copying of Site Content, or features that enforce limitations on the use of our Products. We work hard to protect the security of your content and account, however Shop Local Club Card cannot guarantee that unauthorized third parties will not be able to defeat our security measures. Please notify us immediately of any compromise or unauthorized use of your account. If you choose to submit comments, ideas or feedback to Shop Local Club Card, you agree that we are free to use them without any restriction or compensation to you. By accepting your submission, Shop Local Club Card does not waive any rights to use similar or related Feedback previously known to Shop Local Club Card, or developed by its employees, or obtained from sources other than you. Our Products may contain links to third-party websites, advertisers, services, special offers, or other events or activities that are not owned or controlled by Shop Local Club Card. We do not endorse or assume any responsibility for any such third-party sites, information, materials, products, or services. If you access any third party website, service, or content from Shop Local Club Card, you do so at your own risk and you agree that Shop Local Club Card will have no liability arising from your use of or access to any third-party website, service, or content. We may close your account, suspend your ability to use certain portions of our Products, and/or ban you altogether from our Products for any or no reason, and without notice or liability of any kind. Any such action could prevent you from accessing your account, our Products, Your Content, Site Content, or any other related information. In the event of termination, you continue to be bound by Sections 3 and 8-14 of these Terms. You agree to indemnify, defend, and hold Shop Local Club Card, its parents, subsidiaries, affiliates, any related companies, suppliers, licensors and partners, and the officers, directors, employees, agents and representatives of each of them (collectively, the “Shop Local Club Card Entities”) harmless, including costs, liabilities and legal fees, from any claim or demand made by any third party arising out of or relating to (i) your access to or use of our Products, (ii) your violation of the Terms, (iii) any products or services purchased or obtained by you in connection with our Products, or (iv) the infringement by you, or any third party using your account, of any intellectual property or other right of any person or entity. 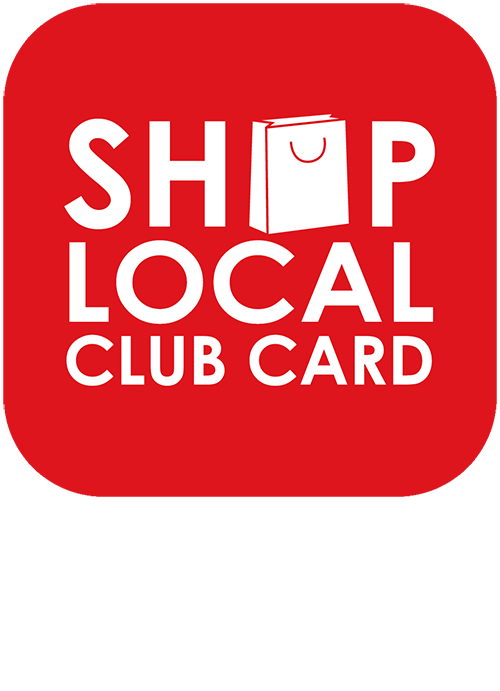 Shop Local Club Card reserves the right, at your expense, to assume the exclusive defence and control of any matter for which you are required to indemnify us and you agree to cooperate with our defence of these claims. You agree not to settle any such matter without the prior written consent of Shop Local Club Card. Shop Local Club Card will use reasonable efforts to notify you of any claim, action or proceeding after becoming aware of it. Unless otherwise expressly provided in writing, the Products and all included content are provided on an “AS IS” and “AS AVAILABLE” basis without warranty of any kind, whether express or implied, unless expressly otherwise provided. Shop Local Club Card SPECIFICALLY DISCLAIMS ANY AND ALL WARRANTIES AND CONDITIONS OF MERCHANTABILITY, FITNESS FOR A PARTICULAR PURPOSE, AND NON-INFRINGEMENT, AND ANY WARRANTIES ARISING OUT OF COURSE OF DEALING OR USAGE OF TRADE. Shop Local Club Card takes no responsibility and assumes no liability for any User Content that you or any other user or third party posts or transmits using our Products. You understand and agree that you may be exposed to User Content that is inaccurate, objectionable, inappropriate for children, or otherwise unsuited to your purpose. Shop Local Club Card is not responsible for any typos, errors or pricing errors. Although we strive to prevent errors, posted prices are not final until transactions are processed by Shop Local Club Card. TO THE MAXIMUM EXTENT PERMITTED BY LAW, Shop Local Club Card SHALL NOT BE LIABLE FOR ANY INDIRECT, INCIDENTAL, SPECIAL, CONSEQUENTIAL OR PUNITIVE DAMAGES, OR ANY LOSS OF PROFITS OR REVENUES, WHETHER INCURRED DIRECTLY OR INDIRECTLY, OR ANY LOSS OF DATA, USE, GOOD-WILL, OR OTHER INTANGIBLE LOSSES, RESULTING FROM (A) YOUR ACCESS TO OR USE OF OR INABILITY TO ACCESS OR USE THE PRODUCTS; (B) ANY CONDUCT OR CONTENT OF ANY THIRD PARTY ON THE PRODUCTS, INCLUDING WITHOUT LIMITATION, ANY DEFAMATORY, OFFENSIVE OR ILLEGAL CONDUCT OF OTHER USERS OR THIRD PARTIES; OR (C) UNAUTHORIZED ACCESS, USE OR ALTERATION OF YOUR TRANSMISSIONS OR CONTENT. IN NO EVENT SHALL Shop Local Club Card’S AGGREGATE LIABILITY FOR ALL CLAIMS RELATING TO THE PRODUCTS EXCEED ANY AMOUNTS (IF ANY) THAT YOU PAID TO Shop Local Club Card. If you are a consumer, please note that the Terms and Conditions, their subject matter and their formation, are governed by English law. You and we both agree to that the courts of England will have non-exclusive jurisdiction over any claim arising from or related to a visit to the website. However, if you are a resident of Northern Ireland you may also bring proceedings in Northern Ireland, and if you are resident of Scotland, you may also bring proceedings in Scotland. If you are a business, the Terms and Conditions, their subject matter and their formation (and any non-contractual disputes or claims) are governed by English law. You and we both agree to the exclusive jurisdiction of the courts of England over any claim arising from or related to a visit to the website, although we retain the right to bring proceedings against you for breach of the Terms and Conditions in your country of residence or any other relevant country. You and we both agree to the exclusive jurisdiction of the courts of England over any claim arising from or related to a visit to the website, although we retain the right to bring proceedings against you for breach of the Terms and Conditions in your country of residence or any other relevant country. These Terms, and any rights and licenses granted hereunder, may not be transferred or assigned by you, but may be assigned by Shop Local Club Card without restriction. Any attempted transfer or assignment in violation hereof shall be null and void. No waiver of any term of these Terms shall be deemed a further or continuing waiver of such term or any other term, and Shop Local Club Card’s failure to assert any right or provision under these Terms shall not constitute a waiver of such right or provision.